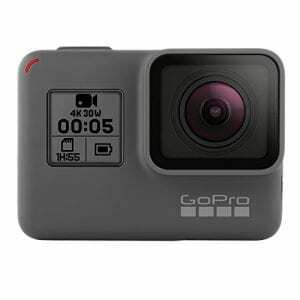 The GoPro HERO5 Black action camera can be taken to the skies, over rough terrain, and even underwater without flinching, recording 4K videos and 12MP photos along the way. 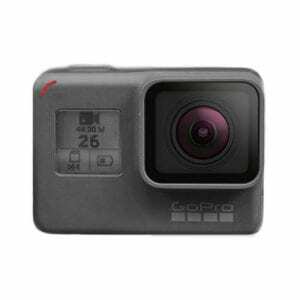 The sealed rubberized chassis allows the HERO5 Black to be taken to depths of 33′ without the need for an external housing. So whether your escapades take you to the lands of concrete, sand, dirt, snow, or water, the HERO5 Black is prepared to record with a single button press. Once you have finished recording, use the touchscreen to playback and even edit your footage right on the camera. It’s hard to speak about the versatility of the HERO5 Black and not mention the mounting possibilities available through the included and separately available accessories. 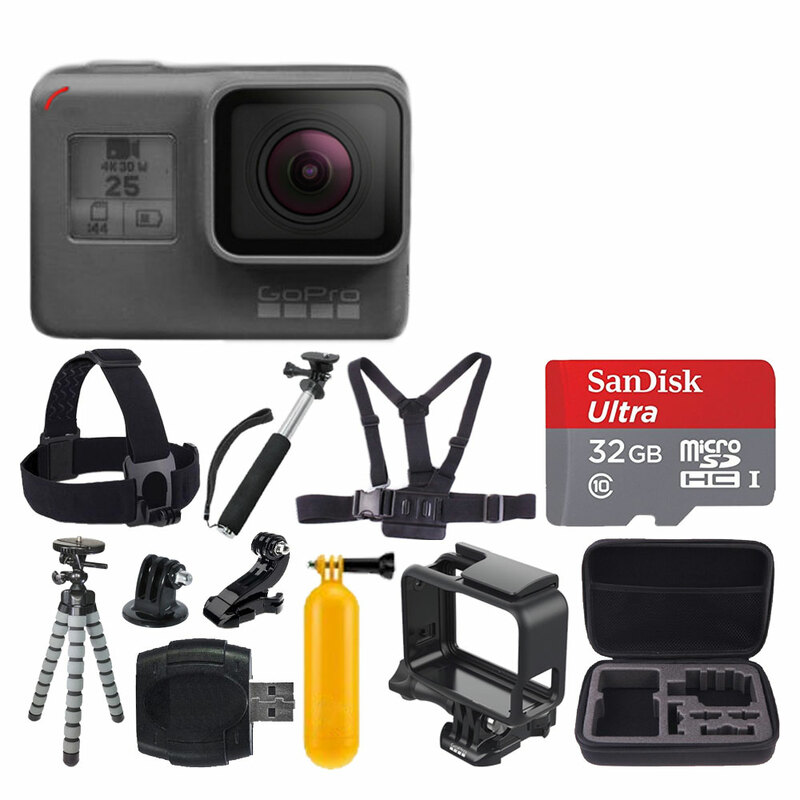 The Frame is included with the HERO5 Black and not only adds another layer of protection, but it also provides an interface to the world of 3-prong accessories. 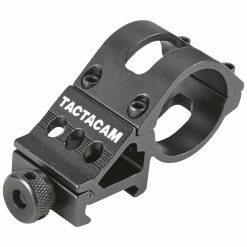 To get you started, a mounting buckle quick-release for The Frame and two adhesive mounts (one curved and one straight) with quick-releases are included. Other accessories such as handlebar mounts, selfie sticks, suction cups, and dive housings for creative placement of the HERO5 Black are available separately. Not only is it more versatile than previous generation HEROs, but it’s also easier to use. A touchscreen graces the rear surface, displaying a revamped user interface, while the front screen combined with the top and side buttons offer a more traditional one-button control experience. If the camera is off, pressing the record button will power it on and immediately start recording. Hands-free control is also possible using the built-in Voice Control feature. 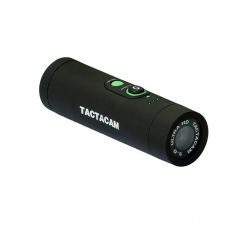 Speaking simple voice commands can control various functions inside the camera, including start/stop video recording, photo burst, and more. SanDisk’s Ultra microSDHC Memory Card is twice as fast as ordinary SDHC and SDXC cards to take better pictures and Full HD videos. It’s a great choice for compact to mid-range point-and-shoot cameras and camcorders to capture top quality Full HD 1080p video and amazing pictures. This is the 32GB edition. SanDisk Ultra microSD UHS-I cards give you the freedom to keep all your digital files with you on your smartphone or tablet. Plus, the included SD adapter lets you move files easily among other SD compatible devices, such as digital cameras and computers. This Premium Custom Case with Removable Foam is the perfect way to transport your GoPro cameras without worrying about damage. 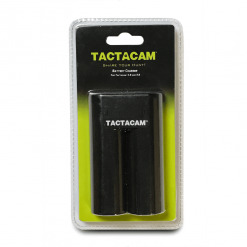 This case neatly organizes and protects your action cameras and various accessories. 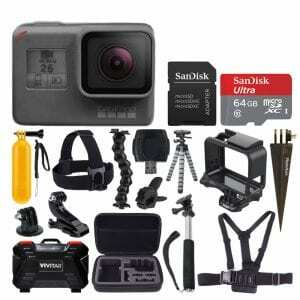 / Fits: 2 GoPro Cameras, extra batteries, plus accessories. 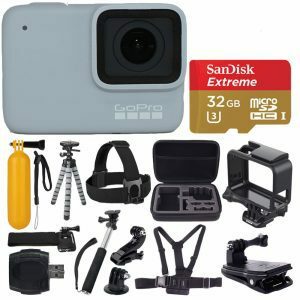 Hard case for GoPro medium size. The Vertical J-Hook Buckle Mount is compatible with GoProHero3+ Hero3 and Hero2, attached cameras to the helmet, allowed you to shoot freedom in outdoor activities. The Xit Extendable Hand Held monopod extends from 8″-43″. It features a padded Grip with a Wrist Strap. The monopod sports a regular tripod mount, it also includes a GoPro mount so that you can mount your GoPro camera. Allows the user to mount any GoPro camera to a tripod. The “Chesty” is fully adjustable to fit all sizes. 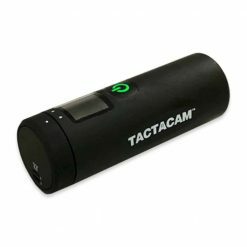 It is easy to capture immersive video and photo footage from your chest. 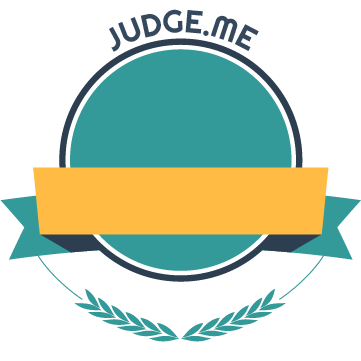 It is perfect for skiing, mountain biking, motocross, paddle sports, or any activity where you want to get a “lower than the helmet” view of the action. Recommended as a more immersive way to film than on the helmet. It’s totally sealed and made of hard plastic. This GoPro Head Strap Mount is Fully Adjustable to fit all sizes. The Head Strap is compatible with all GoPro cameras and great for keeping the footage clear while you shred. Photo4Less gave me the best deal on the product purchased and it was delivered much earlier than expected!